The success of L.A.C.E.S. has been well recognized by the international community. “We have been in Liberia for eleven years,” Seren Fryatt explained from her office in Takoma Park in Maryland. 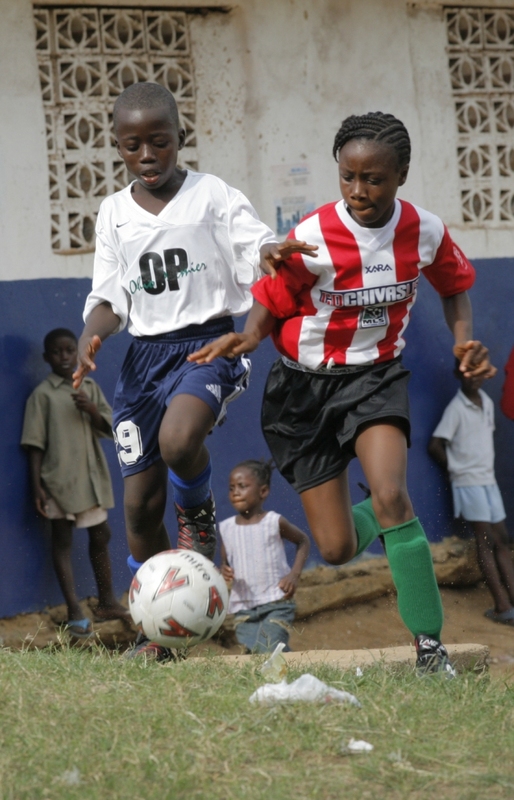 Fryatt just returned from a trip to Liberia to review the in-country operations. “We have seen extraordinary results through the approach of mentoring children through sports.” Because of the success, L.A.C.E.S. has experienced, there has been a crucial demand to expand our role to other countries. This week, a small group of L.A.C.E.S.’s staff from Liberia embarked on an exploratory trip to the Northwest neighbouring country of Sierra Leone. The short distance of 361 kilometres (224 miles) from Monrovia in Liberia to Freetown, Sierra Leone could allow the organization to strategically grow organically. Sierra Leone is often called the “little jewel” in West Africa, because of its natural beauty coupled with mountainous landscapes and rich minerals. Similar to Liberia, the country has had a bloody history of a long eleven-year civil war that began in the year 1991. Over 500,000 people were displaced and over 50,000 were killed, in a country of fewer than 4 million people. As you can imagine, it is the children from this small West African nation that have been witnesses to this turmoil. With 70% of the population living under the poverty line, children are often the most vulnerable of all. In addition, there have been many injustices which include female genital mutilation, lack of education, and forced labour, which have all contributed to human rights’ challenges that face children in this country. “We have a proven model that is very successful,” explained Fryatt, “Now, we want to expand and reach out to more young people through our sports mentoring program.” As L..A.C.E.S. begins to grow its international scope, the goal to bring hope to many children who live on the streets will continue to expand. From July 18th to 22nd, L.A.C.E.S. 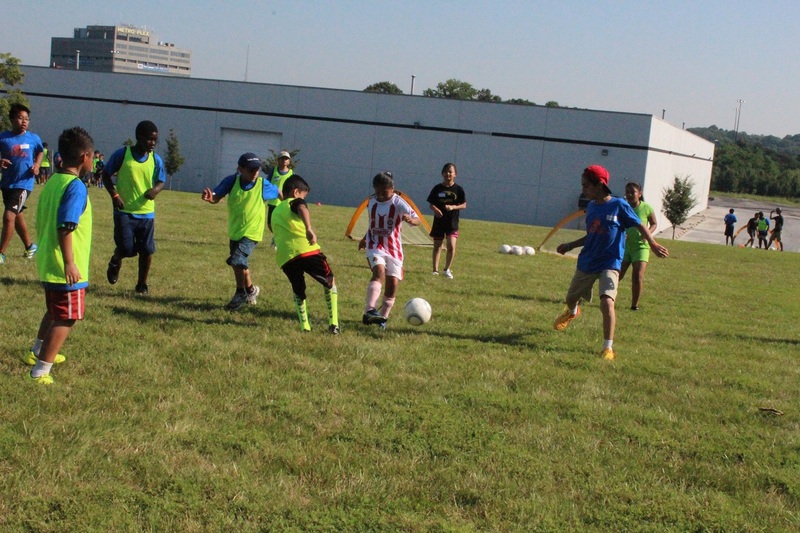 united 44 children from the Greater DC refugee community in its first Youth Soccer Camp. 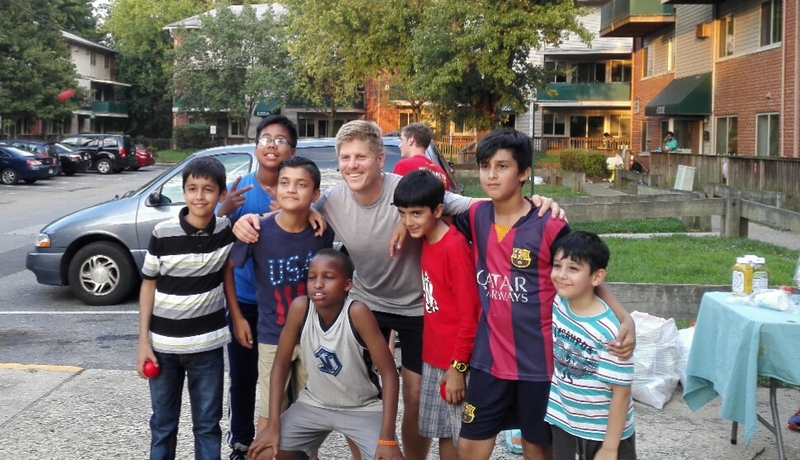 Kids from 14 nationalities, some of them just arriving in the US a few weeks prior, had the opportunity to interact through the common language of soccer. A dream-team of 33 volunteers made incredible efforts to make sure that the children were having a fun, safe and formative experience. 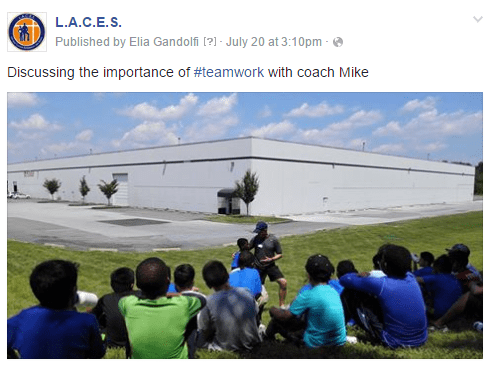 The Camp Director Mike Ekberg, Assistant Coach for Towson University women’s soccer team, structured an amazing program that linked soccer activities to the core values of L.A.C.E.S. The drills were specifically organized around the core values of teamwork, respect, honesty, discipline and fair-play. Frequent water and snack breaks created the opportunity to have mentoring and discussion around these values. 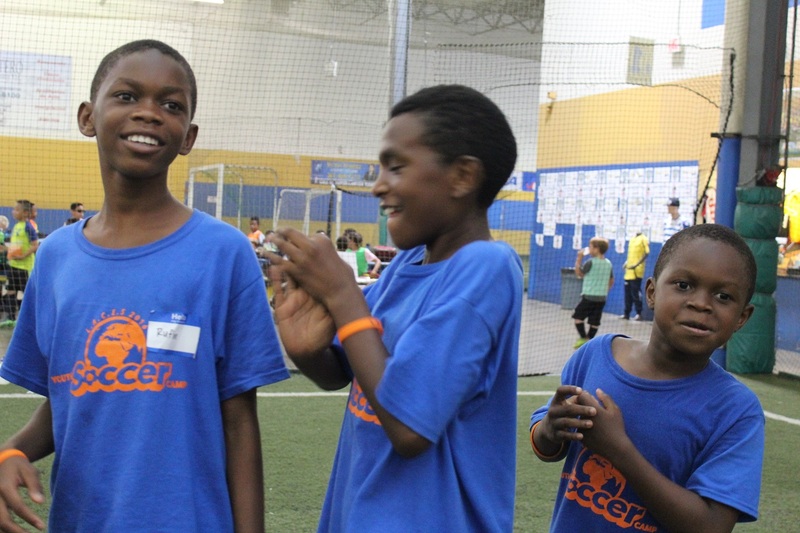 At the end of each day, all the kids came together for a big soccer game, as to have the opportunity to put into practice what they learned about soccer and the core values. During the daily debriefing time the 4 children that displayed the value of that day the best received some yummy gifts. 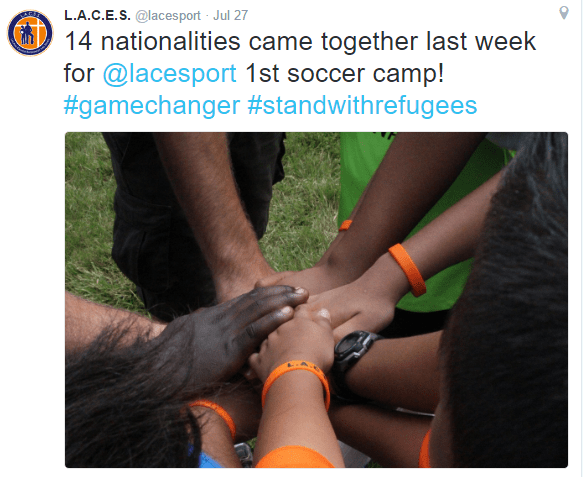 Besides an indoor and outdoor soccer field and all the related equipment, L.A.C.E.S. was able to provide every child with daily transportation, food (2 meals/day and several snacks), a customized water bottle and a soccer ball. 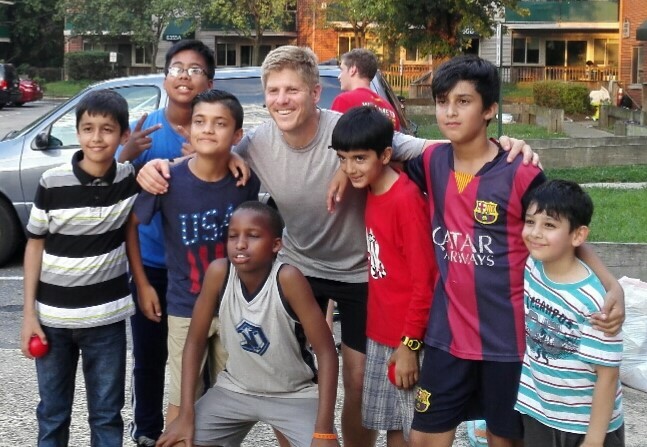 During the evening of the last day, a block party was hosted at the apartment complex where most of the kids live. It was a great opportunity to get together outside of the field, meet the kids’ families, share stories and make new friends. Thanks to the hard work of coaches and volunteers, we could see children making new friends, new life experiences and values, and hopefully a better hope for the future. This successful first step represents only the starting point of L.A.C.E.S. 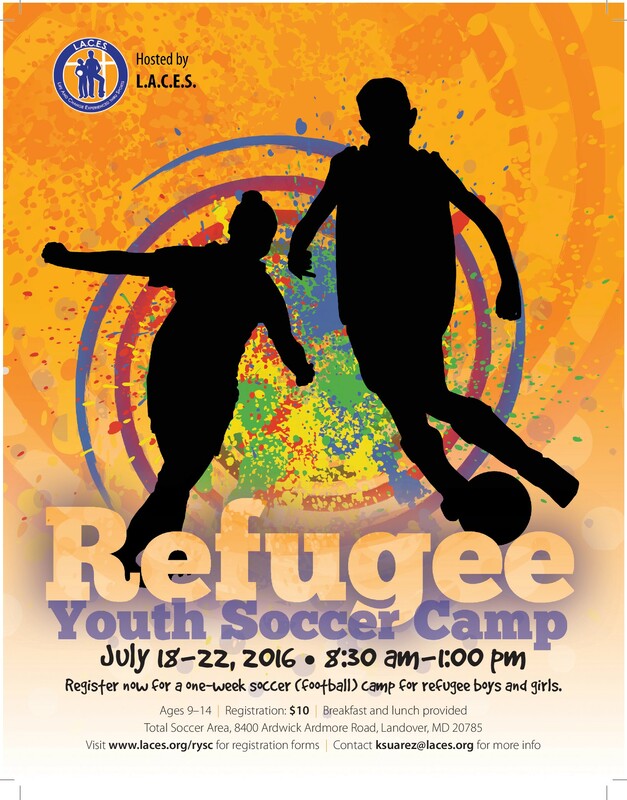 involvement with the local refugee community. The goal for the coming future is to provide consistent programs over the year. So, let’s start to work on it! A huge thank-you goes to everybody who made this wonderful experience a reality!